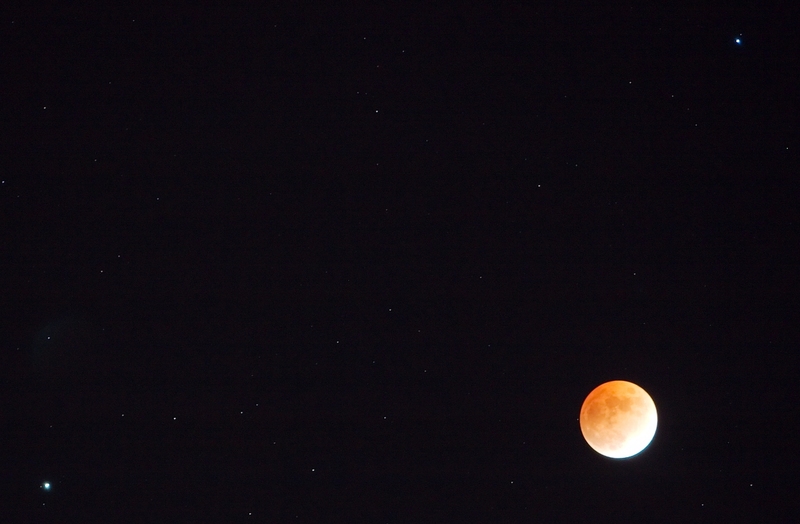 Tonight there was a full lunar eclipse, which is when the moon completely passes through the earth’s shadow. The next one won’t be until 2010. In the picture below, which I took last night, Saturn is the bright spot to left and the star above the moon is Regulus, which is part of the constellation Leo. In my picture you may notice two things: the shadow is beginning to wane in the lower right and the rest is colored red-orange, what historically has been called the blood-red moon and seen as a harbinger of the Apocalypse. It is sometimes called a dragon moon, also appropriate to the apocalyptic imagery. During the eclipse, the moon never got completely dark. The distinctive red/coppery color is a result of the light from the rising and setting sun portions of the earth filtering around it edge and giving the moon its ominous (to some) cast. I see a spiritual aspect to last night’s image. The moon is a reflective body. It has no light of its own, depending on the sun for its Illumination. Even though darkness appeared to overwhelm it, it didn’t last very long and light won out over the absence of light in the end. Replace sun with Son and moon with us and you get the picture. We depend on Christ for the light of life and even when everything appears the darkest, in reality it is only temporary, since the light of Christ overwhelms anything evil has to throw against it. We need to remember that truth, to let it settle into the marrow of our bones and become an intimate part of us.